Prosecco Wines – Comans Beverages Ltd.
A light, sparkling wine with a touch of style. A light semi sparkling wine with honeyed fruit notes on the palate, held together by very well integrated citrus acidity. A wine of real style and finesse. 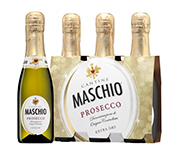 An absolutely delicious thirst quenching Prosecco with a racy, crisp clean fruit finish. Light and beautifully balanced. Colour: Light straw yellow with a lively froth. Bouquet: White peach and orange blossoms. Taste: Fruit forward, with peach and almond flavours.